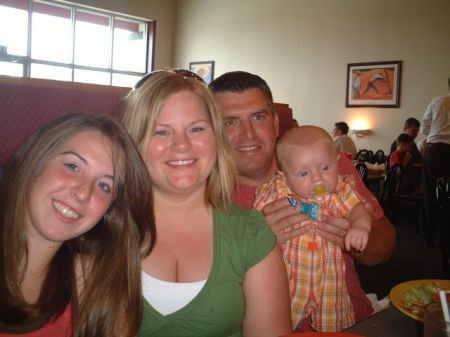 The Poythress Family: Danny, Amy, Brittany and Preston (~4 mos. old at the time) visited us a couple weekends ago. Mara had so much fun visiting with everyone. She particularly likes Brittany who will play with her a lot. Also she enjoyed trying to sit in Preston’s little green chair called the Bumbo Seat. She’s a bit too big so when she’d stand up it would often come with her. The picture of Mara with both hands in a bowl is when we went out to La Fiesta for lunch on Sunday and she was indulging in the sour cream bowl. Forget dipping chips, hands are delicious with sour cream!! Although this wish is a little belated we still want to say Happy 16th Birthday to Brittany. Her birthday was July 31st. We are coming to visit you sometime soon to play some ping pong! Thanks for always entertaining Mara and being so kind as to babysit her for us so we can go out with your parents. Rememeber to click on the picture below to view the album of all the pictures.